Question: Okay, now I know to carry bear spray, but I see lots of photos of anglers fishing near bears without a confrontation. How can you tell the difference between a bear that’s minding its own business and one that’s going to be a problem? Answer: First of all, the only place you’re ever going to fish near bears without worrying is on a river during a salmon run. Bears that are stuffed with food and/or focused on catching more salmon generally won’t be bothered by nearby anglers, unless there are cubs involved. This is a general rule, of course, and all it takes is one animal in a bad mood to make things considerably more uncomfortable. However, inland grizzlies or animals actively searching for food should always be considered dangerous. Chances are, if a bear on a salmon river hasn’t been surprised by an angler, it’s not going to charge right away. Instead, it will signal any displeasure through a series of “displays” that are actually meant to avoid confrontation. These displays are the bear’s way of saying, “Hey, I’m not happy, so unless you want a fight you’d better get out of my way.” Bears use these displays to communicate with one another and thereby avoid injury, since a fight can be dangerous even for the winner. Any angler in bear country needs to be able to recognize the signs that a bear is getting aggressive. On my last day as a guide in Alaska, I took some clients to videotape bear activity at the confluence of Moraine Creek and Funnel Creek on the Alaska Peninsula. It’s a known hot spot, and we saw something like 24 different bears over the course of the day. At one point, however, we got run off a sandbar by a young bear that was probably pissed off because it had been kicked around by his elders all day. Finally, he came across someone, us, that he could bully. The bear, which had been fishing at the top end of the bar—about 50 yards upstream—stopped what he was doing and got out of the water. Display #1: As the bear walked slowly across the bar, although not in our direction, he began looking straight at us. This is unusual and a sign of aggression. Normally, bears will avoid eye contact at all costs, even with other bears. On the videotape, you can hear me tell the clients that the bear is “staring at us,” which means we should start moving. Display #2: The bear turned sideways to us. This is how bears show off their size, as a way to intimidate a possible adversary. Whereas the staring mighthave been just curiosity, there’s no mistaking the intent of the sideways display. Display #3: The “hackles”—or hair on the back of the bear’s neck—stood up, making the animal look much more menacing. Display #4: The bear began shifting his weight from one foot to the other, swinging his head from side to side. I have been told that this is often preparatory to a charge. However, at this point, we were in full retreat, giving the bear no reason to attack. Once we were across the creek and heading away, the bear turned away, content that he had shown us who was boss. It took my clients a few minutes to stop hyperventilating. There are other ways bears show aggression—huffing, foot stomping, and clacking their jaws together, for instance—and your ability to recognize these signs will allow you to know when to back off. 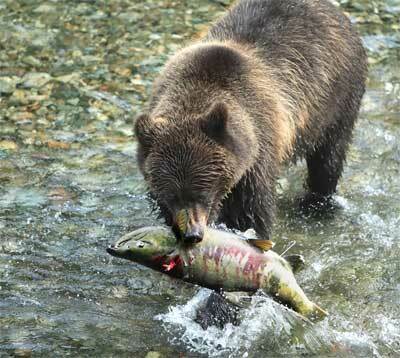 Thousands of fly fishers cast for trout and salmon in bear country without incident every year. In my three years guiding in Alaska, the event described above was the closest I ever came to a real confrontation, and even then I never really felt the bear was going to charge. Although I carried a shotgun, I never needed to use it or even chambered a round out of fear. So, if you’re headed to Alaska or Canada, arm yourself with bear spray and knowledge of bear behavior and then just focus on having a great time fishing.